all occasions. Call George Bailey to customize your order. 321-724-5523.
or special requests only (repeat customers) or a new type of flavor not listed. This basket was created keeping in mind that there are people out there who are not big on coffee. Also this basket is perfect for our younger people because we substitute the gourmet coffee with instant hot chocolate. It includes a Rattan Basket, hot chocolate with and without marshmallows. Gourmet Popcorn plus 2 sweet flavors of popcorn. To and From attached card. $39.95 plus shipping. Tired of searching for the perfect gift? Say no more, just give us a call to send that special person a wonderful gift they will be sure to love. 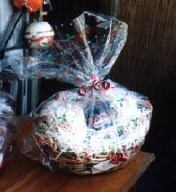 This is our most popular gift basket with many repeat orders. Due to popular demand we now have colorful T-shirts, Golf Shirts, women's sport tops, visors, travel bags, coffee mugs, and more. You can now sport a new look starting at $7.99 shipped to your door ordered over a secure server. Click here to go to our secure server and order online, anytime. Availability: unlimited. These items can only be purchased online.